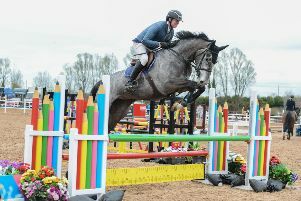 This showjumping league will continue for the next two Friday evenings, commencing at 6.15pm, with a 40cms class, followed by 60cm, 70cm, 80cm, 90cm, 1m and 1.10m. 40cm Class (Double Clears): Niamh McCrossan and Ria; Ellie-Mae McCrory and Dante. 60cm Class (Double Clears): Elizabeth Millar and Ben; Cara Garrity and Henry; Tori Lilly and Finch Ogue Aztec; Dara Flynn and Peter; Ellie-Mae McCrory and Dante. 70cms (Double Clears): Eunan Kelly and Blondie; Elizabeth Millar and Speedie; Hallie Anderson and Pippa; Cara Garrity and Henry; Ellie McNamee and Annie Mac; Lexie Maguire and Leo; Dara Flynn and Peter; Lucie-Ann Abbott and Louie; Amanda Magee and Rosie; Eunan Kelly and Millie; Elizabeth Millar and Ben; Olivia McCrea and Smokie Joe. 80cms (Double Clears): Eunan Kelly and Millie; Kaitlin McCrory and Pop; Conor Harris and Casper; Sarah Boyle and Hey there Delilah; James Douglas and Rolo; Tia Smith and Bugsy; Olivia McCrea and Smokie Joe. 90cms (Double Clears): Katie Clarke and Blue; Tiana Grace Abbott and Echo; Saskia Hale and Pearl; Molly Quinn and Rosie; James Douglas and Rolo; Rhyann McPhillips and Candy; Hannah Jones and Rocket; Amy McLaughlin and Rua; Natalie Somerville and Venus; Mollie Kate Lambe and Socks; Clara Daly and Minty; Lucia Patterson and Sally; Tia Smith and Bugsy. 1m (Double Clears): Freya Sayle and Bungi; Saskia Hale and Pearl; Clara Daly and Lucky; Peter Douglas and Harmony; James Douglas and Spice; Mollie Kate Lambe and Socks; Clara Daly and Minty; James Douglas and Snowy. 1.10 (Double Clear): Clara Daly and Lucky. Week three of the league saw a steady stream of competitors take on Raymond Caldwell’s courses. 40cm Class (Double Clears): Lucy Currie and Cheerna; Emily Bothwell and Lucky Penny. 60cm Class (Double Clears): Cara Garrity and Henry; Emily Bothwell and Lucky Penny; Elizabeth Millar and Ben; Tori Lilly and Finch Ogue Aztec; Scarlett Knox and Annie Mac. 70cms (Double Clears): Elizabeth Millar and Ben; Cara Garrity and Henry; Halle Anderson and Pippa; Amanda Magee and Rosie; Lucie-Ann Abbott and Louie; Connie McFadden and Charlie; Zara Hamilton and Bambi; Elizabeth Millar and Speedie. 80cms (Double Clears): Zara Hamilton and Mindy; Lucie-Ann Abbott and Louie; Molly Quinn and Rosie; Halle Anderson and Pippa; Amanda Magee and Rosie; Emily Marshall and Poppy; Freya Sayle and Better than Dexter; Hannah Jones and Rocket. 90cms (Double Clears): Sarah Boyle and Hey there Delilah; Jordana Mitchell and Rosie; Molly Quinn and Rosie; Saskia Hale and Pearl; Jessica Honeyman and Jojo; Tiana-Grace Abbott and Echo; Cara McFadden and Mindy; Zara Hamilton and Mindy; Emily Marshall and Poppy; Hannah Jones and Rocket; Katie Clarke and Blue. 1m (Double Clears): Carly Breydin and Melissa; Saskia Hale and Pearl; Tiana-Grace Abbott and Echo; Cara McFadden and Dex; Carly Breydin and Millie; Clara Daly and Lucky. Competitors are reminded that the same combination rider/pony must compete in the same class for three out of the four weeks leading up to the final to be eligible for prizes on April 19. For further information on the league or the super league, contact Sandra on 07990541966 or Ecclesville Centre on 028 82840591.